Ready in just 6 minutes. or antibiotics and beef that is grass fed. Created to bring gourmet prepared meats to your table in minutes, by Amos cooks and seasons naturally raised meats to provide you with a quick and easy meal solution using sous-vide cooking. Since our meats are all precooked and pre-seasoned, all you have to do is brown the meat on both sides in a pan or grill/BBQ and you can create a healthy and delicious meal in 6 minutes. It’s an innovative French cooking technique used in many high-end restaurants. Food is heated over a very long period of time in a precise low-temperature, water-based oven. This slow process maximizes flavour and tenderness by allowing meats to simmer in their own juices. 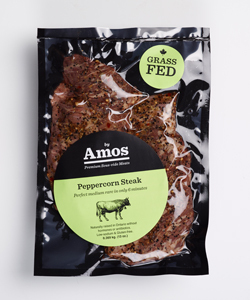 In the 1970’s, my father, Amos, started one of Canada’s first artisan boutique butcher shops as well as his own unique line of gourmet prepared foods. He always believed in using the best and most natural ingredients available, and supported local farms well before it became a popular practice. I started by Amos and apply the same basic principles that my father did — using high quality, naturally raised meats and honest ingredients. His passion for good food lives on in me and in the entire by Amos product line. Rich organic coffee paired with floral citrus coriander, sure to awaken your palate. Classic steakhouse flavours of garlic, mustard, onion and peppercorn. Bold lemon and orange zest, fresh and lively. An ancient blend of mustard seeds, rosemary, fennel and coriander roasted to perfection.